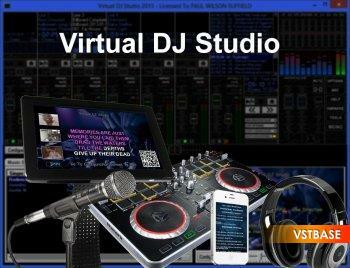 Virtual DJ Studio gives you a mixer-board interface. Each line offers things you would expect from a typical mixer – volume fader, mute, crossfader assignment, etc. Additionally, each line contains an MP3/WAV/Karaoke player, with all of the controls you might expect – including a Pitch/Tempo control. If you have two or more sound cards/audio devices, you can route any line to your secondary device, for headphone preview or beat-matching. Alternatively, you might use this feature to simply allow more control with your external mixer.